Need a place to sew in your Utility Room? This Country Home even has a sewing closet in the Utility Room. The long Living Room and Dining area has ample space for the long country harvest table. The designer suggests corner cupboards on each side of the double windows. The oversized fireplace has a wood box and a wide hearth. This is the pleasant view as one walks down the railed entry way to the open stairway. The step down from the foyer can be eliminated if desired. Note the kitchen is free of unwanted traffic, yet convenient to serving the dining table. 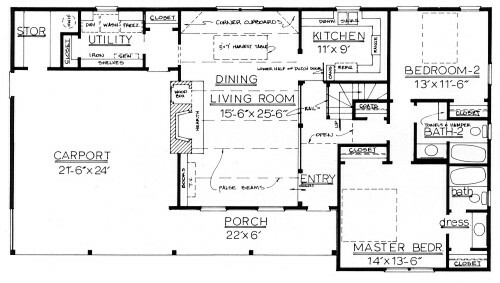 The Master Bedroom has space for a king-sized bed and a ('his' and 'her' closet. 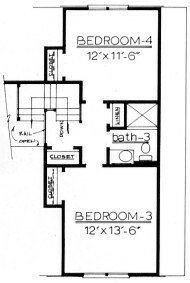 Two bathrooms serve the main floor and a full bath separates the two Bedrooms on the second floor. If scissor trusses are used over the Living/Dining Room, you can view the large fireplace from the open stairway. The Utility Room has its own closet as well as space for sewing or ironing. The Carport or Garage can open from the end with windows on the front wall.